German 'Infantrist der Zukunft' (IdZ) future infantryman program vest. 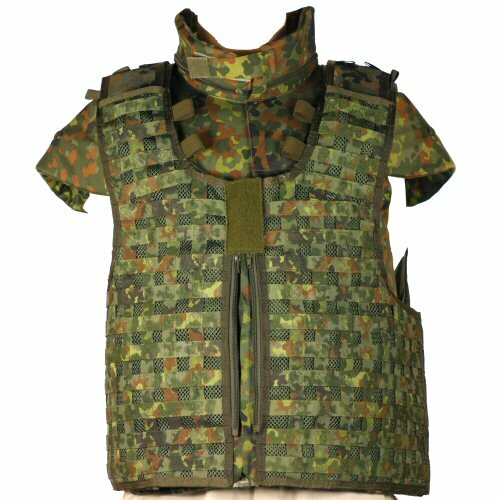 This is an 'over' vest which is designed to be worn over a body armour vest, although it can also be worn without a body armour vest. 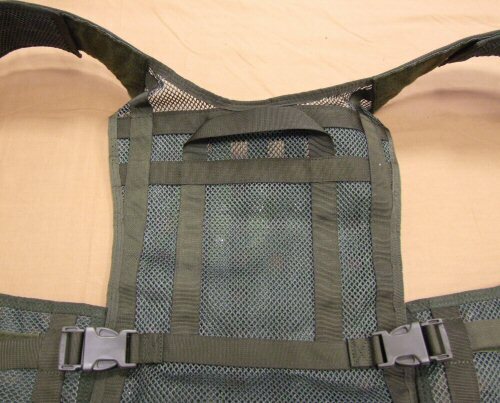 The vest consists of a double layer of heavy duty nylon mesh netting on which crosswebbing is mounted on both the horizontal and vertical directions. This allows pouches to be mounted horizontally and vertically, increasing the versatility of the modular design. The cross webbing is made of flecktarn-printed cordura narrow webbing, for strength and durability. The vest is fully adjustable over the shoulder and at both left and right sides. Long velcro panels over the shoulder allow the vest to be adjusted for a range of heights from 5'5 up to 6'6. The left and right adjustment will permit the medium-large vest to be adjusted from a 38 inch chest up to a 48 inch chest, and the xlarge-xxlarge vest to be adjusted from a 42 inch chest up to a 58 inch chest. 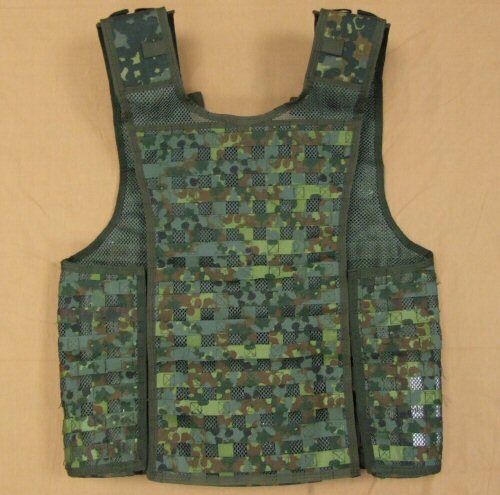 The body of the vest is long, so as to accommodate riding-up as a result of wearing a bristol body armour, if required. The vest features two large zip-up dump pockets, one each on left and right sides. These are mounted on either side of the zip front without interfering with the operation of the zip front. 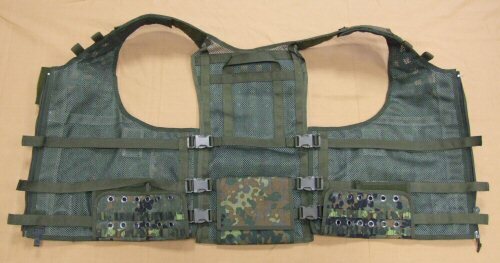 On the lower front sections of the vest, there are fold-away German webbing plates to accept the addition of pouches from the German webbing system. These are secured up into the vest by velcro when not required. The lower back and sides are adapted to retain the optional hip pad if required. Available options are: M-L , XL-XXL . View of rear of vest. View of the vest, opened, from the interior. Clearly visible are the carrying handle and re-inforced webbing straps, side ajdustment left and right, with quick release buckles, lower back velcro opening flap for attaching the hip pad, and the LKS panels on left and right hip. 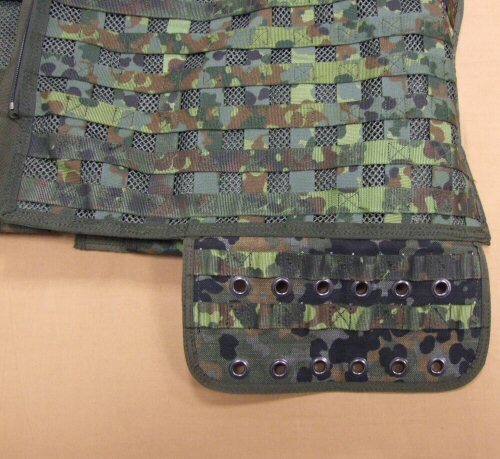 Another view of the hip panel with holes for the LKS webbing and 1cm wide MOLLE straps for pouches. A closer view of the carrying handle and the highest side adjustment on quick release buckle. The shoulders can adjust for height via velcro.